4Media FLAC Converter is a powerful, professional solution designed for converting FLAC(Free Lossless Audio Codec) audios into the most popular audio formats like AAC, AC3, AIFF, APE, AU, M4A, MP2, MP3, OGG, RA, WAV, WMA and etc. High quality converter engine guarantees performance boost on multi-threading and multi-core CPU. 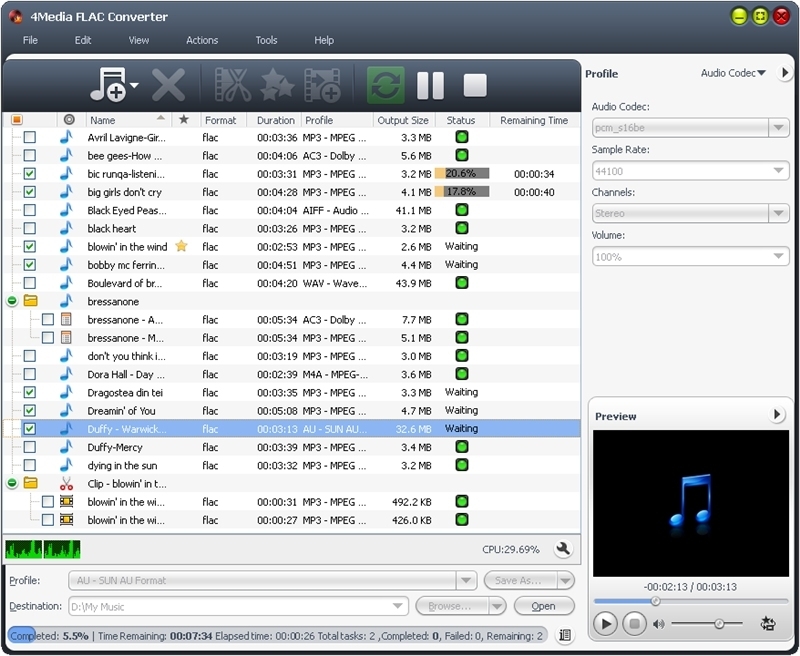 1.4Media FLAC Converter enables you to convert FLAC(Free Lossless Audio Codec) audios into the most common audio formats for playback on media players without quality loss. 2.Support more than 10 output audio formats: AAC, AC3, AIFF, APE, AU, M4A, MP2, MP3, OGG, RA, WAV, WMA, WAV lossless and WMA lossless. 3.Batch conversion is offered to proceed multiple tasks at one time to save time and effort. 4.Surprisingly fast converting speed to accelerate the processing course due to the multi-threading and multi-core CPU technology. 6.Specify the start point and end point of the audio to clip any segment from the source to keep interested parts. 8.Get a better audio visual effect by Bitrate, Sampling Rate and Channels and other parameters. 9.Edit ID3 information for music files to distinguish them from others. 10.Built-in player to play your audio file before and after the conversion, it is also the best way to find the difference between formats. 11.Set audio conversions to run at the background and save CPU resources for other applications.